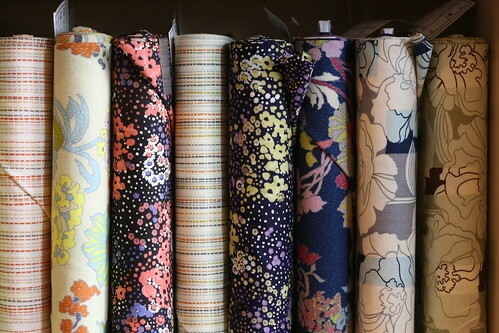 I am a big fan of Lecien, the Japanese manufacturer of beautiful quilt and apparel weight prints. The top photo shows off some of the new medium weight blend (cotton/linen) prints and the bottom is a sampling of some of the new quilt weight cottons from Hokkoh. The medium weight prints would sew up beautifully into a new autumn skirt or a lighweight coat. And since I can't stop thinking about that book, the quilt weight cotton is especially appealing to me right now-- especially the tiny florals. There's more from Lecien in the store, but you'll have to come in and check it out. *Colette's hot-of-the-presses wrap dress, Crepe, pattern is here and it's beautiful. This pattern is especially geared to the beginner apparel sewists among us. 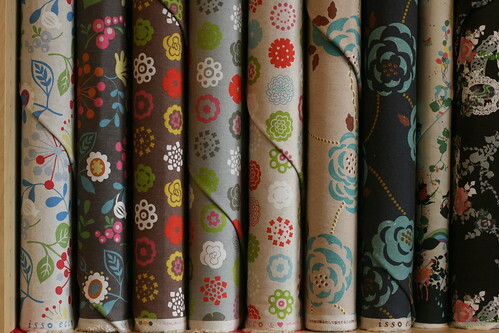 They are running a part 2 of their extremely informative "Before You Sew" blog series this month as well. Check out previous posts on sewing with silk and prewashing-- I'm looking forward to some more pattern cutting tips. *Betz White, queen repurposer and author, has come out with a line of "Make New or Make Do" patterns. Are you seeing the tree stump-turned-pin cushion?! Cute. Check the pattern bins for more. gina October 5, 2010 Accessories, Apparel Sewing, Fabric, Gift Giving, Home Dec.